Water and fruit will be provided courtesy of Food Lion before and after the 10K/5K race. Family fun run: $10, Runners 5 & under free if accompanied by an entrant at least 16 years old. 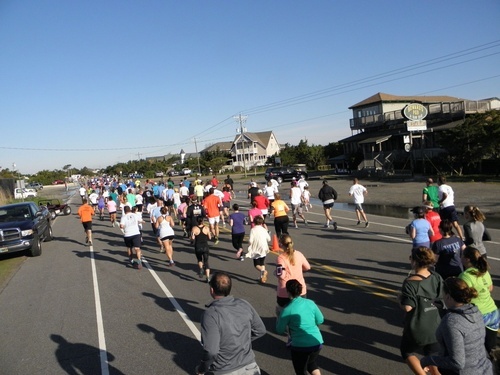 All family fun run participants will receive a medal and refreshments courtesy of The Ocracoke Coffee Co. Runners in half marathon, 10K & 5K receive a high quality, quick dry t-shirt, along with tote bag courtesy of Soundfeet Shoes. Sizes only guaranteed if registered before April 14th. The Lt. Maynard's Challenge is just the thing for you! Lt. Maynard's Challenge participants will complete either the Jolly Roger 5K or the Queen Anne's Revenge 10K on Saturday, April 28th and then the Blackbeard's Half Marathon on Sunday, April 29th, 2018.